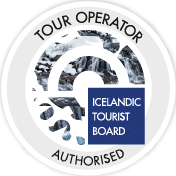 Join this guided Snæfellsnes tour and experience the amazing nature of this stunning peninsula which is sometimes referred to as miniature Iceland. Join this guided Snæfellsnes tour and experience the amazing nature of this stunning peninsula. Your guide will pick up at your accommodation around 8.00 AM, or you can meet him at Harpa Opera House at 8.20 AM. Your first stop of the day will be at Gerðuberg, beautiful column basalt formations, with columns up to 14 meters of height and 1 – 1.5 meters in diameter. Rauðfeldsgjá canyon is a narrow fissure in the mountain Botnsfjall. It gets narrower the further you go inside. A small stream and a waterfall inside, makes this trip a bit tricky and humid. It is said that the canyon is guarded by a ghost named Bárður. Bárður was half man and half troll and had beautiful daughters. His brother Þorkell had two sons, Rauðfeldur and Sölvi. One day, when the children were playing at the beach, Rauðfeldur pushed Helga, Bárður older daughter, on to an iceberg which drifted all the way to Greenland. Bárður was so angry that he pushed both brothers off a cliff, Rauðfeldur into a canyon, which is now Rauðfeldsgjá, and Sölvi off a nearby cliff that is now Sölvhamar Cliff. After the drama, Bárður is said to have gone into the glacier and was never seen again. It is believed that Bárður still watches over this area. Next up is Vatnshellir lava cave, a lava tube in a 8000 year lava field. The lava was formed in an eruption in a nearby crater Purkhólar. During the eruption the lava flowed downhill, cooling down on the surface while still running below, ultimately draining out and leaving a beautiful lava tube, which is now accessible. Hellnar is a small and ancient fishing village. The beach has amazing rock formation which we will visit. Djúpalónssandur black beach. Djúpalónssandur black beach is a bay at the tip of Snæfellsnes Peninsula. The black small pebbles on the beach have been smoothed by the ocean waves, and amongst them are scattered rusty parts of a wreckage of a ship that stranded in the area in 1948. In the old days fishermen used to test their strength by lifting heavy rocks, that still lie there. Heaviest is Fullsterkur (“full strength”), weighing 154 kg, next is Hálfsterkur (“half strength”) weighing 100 kg, hálfdrættingur (“weakling”) weighing 54 kg and Amlóði (“Useless”) 23 kg. They were traditionally used to qualify men for work on fishing boats, with the Hálfdrættingur being the minimum weight a man would have to lift onto a ledge at hip-height to qualify. Lóndrangar cliffs are rock peaks that have formed by erosion of the surrounding material. Lóndrangar are volcanic plugs of basalt, at 75 and 61 meters of height. Kirkjufell, located on the northern site of the Snæfellsnes Peninsula, is one of the most picturesque mountains in Iceland, and with the Kirkjufell waterfall in the vicinity makes a wonderful nature stop. Your guide will then take you back to Reykjavík in the late afternoon.